After the design change comes the first update 2014, in this update have been uploaded 96 new Mechanical manualThese are the new Workshop manuals and repair of vehicles which have risen since last year. Owners and Maintenance Manual Chevrolet Malibu LTZ Manual. Manual repair and maintenance of the bike Bajaj Pulsar UG150 UG180 and in English. Owners manual and user manual Ford Fiesta 2007 max. User Manual and owner of the bike Yamaha FJR Yamaha FJR 1300A 1300 and manual. Network E87 aboard the BMW. Information 1 global network of BMW series. User Manual and owner of Chevrolet Sail also known as Classic Chevrolet Buick Sail or manual. Diagrams and Wiring Diagrams Yamaha Virago XV 750 bike. The manual is in Spanish. Technical Specifications of Hyundai van diesel H100 2.5 including torque specifications. English manual of step by step procedures for all Subaru models (except Justy). Manual repair and workshop manual bulldozer JS200 tier II. This is the Isuzu diesel is also valid for other models of excavators engine manual. Parts Catalog Motorcycle Kymco Spike 125 R. The manual is written in English with some Spanish. Workshop manual, service and repair for engine Mitsubishi Galant 6A1. This workshop manual is written in English. Owner Manual and User CB900F Honda motorcycle. This owner's manual is written in Spanish. Workshop manual, service and repair Honda CBR RR 929. ste workshop manual is written in English. Very complete shop manuals for excavators CASE CX210, CX230 and CX240. This workshop manual is written in Spanish. In this file you can find several shop manuals, owner and DIY for Honda ST50, ST70, CT70 and DAX models. Workshop manual, service and repair of mechanical Vochera. This manual is written in Spanish. Workshop manual, service and repair of the Ural motorcycle. This workshop manual is written in German. Workshop manual, service and repair engine and Detroit series 50 60 series. Fits models 1999. This document is written in English. Exploded CNHTC Howo truck-Huaxin, WD615 model. Fits vehicles manufactured in 2008. Exploded These are written in Russian. Hino truck operator 300 Manual Series. This manual is written in Spanish. Owner and User Manual Motorcycle Bultaco Lobito MK3, made 1972. This workshop manual is written in Spanish. Exploded Manual for MG MGB, Tourer, GT and V8 models. This manual cutting of 1976 data and is written in English. Exploded view and parts catalog Deutz-3L F6 912 / W + E-Pac. This workshop manual is written in different languages: German, English, French and Spanish. No part 2 exploded for trucks CNHTC Howo Huaxin, WD615 model. This manual serves breakers for vehicles manufactured in 2008 and is written in Russian. Operating Manual Loader Case 621E TierIII. This operator's manual is written in Spanish. Electric Diagram Fiat Palio 2008. This manual is written in Spanish. Picture of Nissan Xterra Quick Reference 2002. This manual is written in English. Workshop manual, service and repair as well as cutting the Chevrolet Aveo. This manual is written in Spanish. Workshop manual, service and repair of Hyundai car H1, made 2002. This workshop manual is written in English. Owner Manual and User Axis 90 motorcycle. This manual is written in Portuguese. Workshop manual, service and repair of ESP, ABS and TCS systems. This manual is written in Spanish. Owners Manual and user-9 5 Saab car models manufactured in the year 2003. This workshop manual is written in English. Manual for use and maintenance Pegaso Aprilia Motorcycle 650, made 2001. 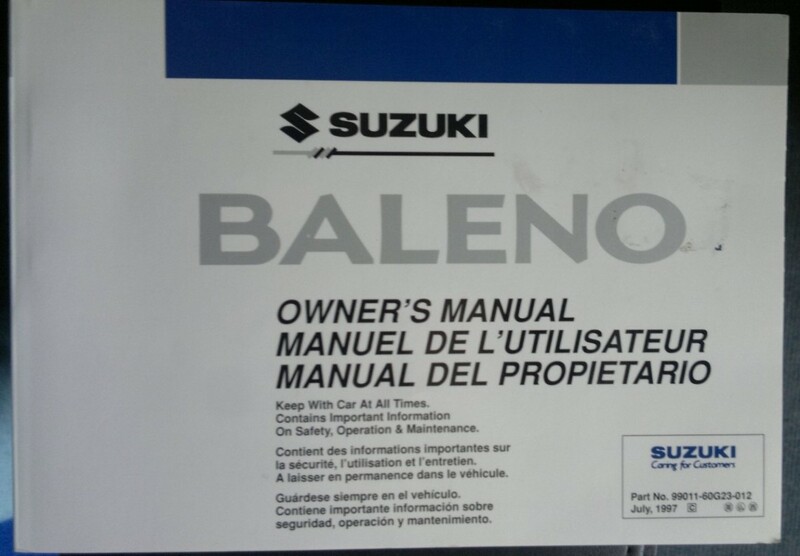 This use and maintenance manual is written in Spanish. Workshop manual, service and repair the car Suzuki Swift made 2006. This workshop manual is written in Spanish. Exploded view and parts catalog motorcycle Hyosung Aquila GV 250. Covers 2000 model year onwards. This manual cutting is written in English. Owners Manual and Renault 5 user. Fits models manufactured in 1981. This user manual is written in Spanish. Owner and user of the Saab-9 3 M2004 Manual. This owner's manual is written in English. Technical Specifications Mazda R2. Covers models from 1985 to 1996. It is a document of two pages written in English. Workshop Manual, service and car repair Isuzu Trooper UBS 1998-2002. This workshop manual is written in English. User Manual and owner of the bike Aprilia AFI1 future 50 to 1992 models. This owner's manual is written in Italian. Workshop manual, service and repair of Volkswagen Golf car manufactured between 1998 and 2000. This workshop manual is written in Spanish. Workshop manual, service and repair of JCB backhoes 3CX, 4CX, 214e, 214, 215, 217 and its variants. This workshop manual is written in English. Technical Specification Guide for transmissions, clutches and power systems Eaton. This document is written in Spanish. Workshop manual, service and repair of the bike Aprilia Rotax 122. This manual covers models 1995. This workshop manual is written in English. Workshop Manual, Service and Repair "Keeping your Volkswagen alive. Procedures Manual step by step for idiots." Manual operation of the fuel injection system Motronic. This workshop manual is written in Spanish. User Manual and owner of Jeep Liberty 2010. This workshop manual is written English. Owners Manual and user 2012 Ford Edge. This workshop manual is written in English. Workshop manual, service and repair Motorcycle Kawasaki Ninja and GPX250R 250R. Fits models manufactured in 1987. This workshop manual is written in English. Workshop manual, service and repair MK1 Fiat Punto. This workshop manual is written in Polish. Repair Manual, operation and use of Bobcat skid steer S130. This manual is written in Spanish. Workshop manual and operating systems common rail diesel injection. This workshop manual is written in Spanish. Workshop Manual Complete service and repair of car Audi TDI A3 1.9 8L. This workshop manual is written in Spanish. Workshop manual, service and repair the car Land Rover Freelander. Fits models 2001. This workshop manual is written in Spanish. Workshop Manual showing disassembly Motorcycle Kymco Bet & Win 250. Workshop manual, service and repair Honda motorcycle and XL600V XL650V Transalp and Africa Twin XRV750. These workshop manuals are written in English. Workshop manual variable distribution systems, written in 2007. This workshop manual is written in Spanish. Electrical diagrams or Atego truck electrical system. This manual is written in German. Workshop manual, service and repair Suzuki motorcycle GSX1300BKA B-KING. This workshop manual is written in English. Workshop manual, service and repair of VAZ Lada 21213, 21214, 21215. This workshop manual is written in English. Workshop manual, service and repair Honda motorcycle VFR750F, manufactured between 1990 and 1996. This workshop manual is written in English. Operating manual and user 6230 John Deere, and 6330 6430 machine. This user manual is written in English. Workshop manual, service and repair Z1000 Kawasaki motorcycle, made 2006. This workshop manual is written in English. Workshop manual, service and repair Toyota Avensis Engine 2AD-FTV/FHV Common Rail system. This workshop manual is written in English. Workshop manual, service and repair Harley Davidson Sportster XLH and 883 1200. This workshop manual is written in French. Workshop manual, service and repair of engines Agrale M80, M85, M90, M93. This workshop manual is written in Portuguese. Workshop manual, engine service and repair of Volkswagen LTD 6 cylinders. This manual is written in English. Workshop Manual, Service, Repair WE repair and diagnostics for John Deere tractors 6110J, 6125J, 6130J and 6145J. This workshop manual is written in Spanish. Workshop manual, service and repair of transmission and Dana Spicer TE27 TE32. This workshop manual is written in English. Workshop manual, service and repair of BMW car 3, manufactured between 1999 and 2005. This workshop manual is written in English. Workshop Manual, Service and Repair Chevrolet GMC trucks manufactured between 1988 and 1998. This workshop manual is written in Spanish. Owners Manual and user MK1 Fiat Punto. This workshop manual is written in Spanish. Workshop manual, service and repair the car Subaru Impreza, manufactured between 1997 and 1998. This workshop manual is written in English. Guide reset indicators in several models of Mercedes cars. This guide is written in English. Books from head torques for gasoline engines Taranto. This manual is written in Spanish. Workshop Manual, service and maintenance of Kalmar DRF and 400 450. This workshop manual is written in English. Workshop manual, service manual and repair manual B20 B30 mounted on the Volvo Personvagnar. This workshop manual is written in Swedish. Workshop manual, service and repair motor Sisudiesel 320, 420, 620, 634. This manual is written in English. Owner and User Manual Motorcycle Yamaha YZ250 (N) / LC. This manual is written in English, French, German and Italian. Books Ural truck parts includes complete engine exploded. Owners Manual and Honda motorcycle competitions 250 CRF2008X the year in Spanish. Manual Technical Specifications Engine Volvo D12C and D12D. This workshop manual is written in Spanish. Workshop manual, service and repair of front loader WA320-3 1997 made. This workshop manual is written in English. Manual workshop service and repair Yamaha motorcycle and XJ750RK XJ750RH Seca. This workshop manual is written in English. Books from parts of the injection pump John Deere Pink Master. The manual is in English. Owner and motorcycle competitions 250R year Honda CRF 2009 Manual in Spanish. Electrical diagrams Bulldozer (Bulldozer) Komatsu D275AX including error codes.